Because I’m biracial, there has never been a time in my life when I had to travel less than twenty-five minutes to reach my hair stylist (and I’ve traveled much further than that), so why would I be able to get my hair done for my wedding without a little extra effort? But my hair looked awesome on my wedding day, and the extra effort is something I’m used to. And, like always, I got the look I wanted without turning to mainstream wedding blogs or beauty magazines for advice. 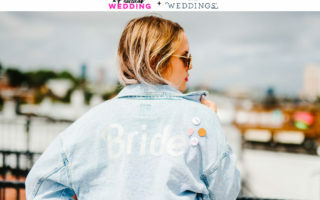 Women’s media outlets are quick to run articles with headlines like “Cool Celebrity Hair Stylist X’s Secrets to a Great Coif” or “How to Prep Your Tresses for Your Wedding”… but what they often mean is “Cool Celebrity Hair Stylist’s Secrets to a Great Coif (If You’re White)” or “How to Prep Your (White Girl) Tresses for Your Wedding.” They fail to take into account that no, not all hair should be dirty when you go in for an updo (what does that even mean to a black woman who washes her hair once a week, and whose clean hair achieves perfect hold without any hair spray? ); no, your tips for “beachy waves” are not going to help us; no, we don’t want to hear you schill the latest “must-have” product for white hair. (They also fail to take into account that “coif” and “tresses” are dumb words that people do not use in real life.) Sure, that stylist might work with celebs, but if they are all white celebs? I am not here for that. So, when Pantene (who we partnered with on last year’s hair donation project and our affordable hair and makeup tutorials) asked us if we would be interested in interviewing Kim Kimble, who is both a celebrity hair stylist and celebrity black hair stylist, about wedding hair, we obviously said yes. She does Kerry. She does Beyoncé. She does Oprah. She can tell me her secrets to a great hairstyle. And while I wish we didn’t have to have separate (but equal!) articles for all the different shades of women, that’s the world we still live in. And if separate advice means we all can look and feel like Olivia Pope Winfrey Carter-Knowles at our weddings (maybe with a little Janelle and Solange too?! ), I can live with that. APW: What kinds of trends are you seeing in wedding hairstyles for black women? What are some of your favorite styles for women for 2014? Kim Kimble: In the past, brides tended to start growing their hair out long before the wedding for more versatility in styling options. Right now, we’re seeing a strong trend in brides who are going short for the big day, not being afraid to go for a sophisticated bob or edgy pixie cut. My personal favorite wedding style is a classic updo that can be taken down after the ceremony. It’s nice to let your hair down when the party begins! APW: If a woman is thinking of doing a weave for her wedding, do you have any tips or recommendations? How close to the wedding should you have it sewn in? Kim: I recommend doing a weave a few weeks before the wedding, if that’s the route you’ve decided to go. This will give you time to make sure the style works for you and learn the best way to style it. APW: Do you have any tips for women who are thinking of going natural for their weddings? How much time should you give yourself to make that transition? Kim: If you’re going natural for your wedding, ideally you should give yourself three or four months to transition. This will give you plenty of time to grow the hair out, and learn your natural curl pattern and how best to style it. Your natural hair will have different needs and you will want to have time to learn the best techniques so that you look your best on your big day. APW: Any advice for naturals and transitioners on choosing a good hairstyle for their wedding (especially for women with different hair lengths, textures, etc.)? Kim: For wedding hair inspiration, take time to research styles, and don’t be afraid to draw inspiration from a variety of sources, such as red carpet, the runway, movies, magazines, etc. Pinterest is a great way to keep track of these styles, as the web is your ultimate resource. I like to keep a folder on my desktop of styles I love, and revisit it every now and then for my own inspiration. APW: What are your favorite products for defining curls, getting smooth blowouts, and strengthening the hair? Kim: For strengthening, I love the Pantene Pro-V Deep Restoration Complex Weekly Rehab Crème. It’s a rinse-off treatment that delivers brilliant shine and lasting smoothness, even on damaged, color-treated hair, leaving it looking smooth, healthy, and shiny. For curl definition, my go-to product is the Pantene Pro-V Curly No Crunch Curls Whip, which will enhance your natural waves while still leaving hair silky and touchable. For smooth blowouts, I love Pantene’s Smooth and Sleek Taming Shampoo and Finishing Conditioner, which combats frizz even in the humidity often present during wedding season. APW: Do you think black women face any specific pressure with regard to their hair on their wedding day? If so, do you have any advice for dealing with that? Kim: I think women of all ethnicities face pressure on their wedding day, as it’s a huge day and they want to look their best. It’s particularly hard if you’re getting married in a climate that can be tough on your hair, such as somewhere with high humidity. The best way to approach this is to plan ahead. Keep your hair clean and moisturized and avoid styles that cause a lot of damage to hair during the months leading up to your big day. Use the products that suit your individual hair needs. One of the things I love about Pantene is that they have products for every hair type and its specific needs. APW: You’ve worked with a lot of amazing celebs… can you share any of their hair or beauty tricks? Kim: Celebrities have hair issues and needs just like non-celebrities, so the hair tips I give them are the same as I’d give my typical salon clients. Two simple tips I swear by are sleeping with your hair wrapped in a silk scarf to preserve the style, and rinsing with cold water when shampooing for an extra boost of shine. While we were thrilled to have the opportunity to work with Pantene’s celebrity stylist Kim Kimble for this post, please note that the above content is not sponsored.